If you are looking for property, lake access lots, or homes for sale in Cuscowilla, you clearly have good taste! Those lucky enough to own property in Cuscowilla know that the homeowner amenities can’t be beaten. Cuscowilla is a great place to buy a primary residence home or a second home for that matter. Cuscowilla is a safe, gated community, spanning about six-and-a-half miles of waterfront Lake Oconee real estate. Although many people only think of golf, Cuscowilla has so much more than that! If you buy property in Cuscowilla, you will enjoy a gorgeous waterfront pool, an excellent restaurant overlooking the lake, tennis courts, dog parks, and community boat docks. The enormous (14k sq. ft.) clubhouse was designed by Frank Lloyd Wright, and includes a gym and a pro-shop. In addition to gorgeous single family residences, the homes available for sale include golf cottages, Tuscany villas, and luxury condos. Cuscowilla is extremely popular with retirees from “up north.” While most of them will cite our excellent golf course as their first reason or buying real estate here, we know our mild winters are a big draw. In the winter, our average high is 56°– perfect golfing weather for owners of Cuscowilla real estate. Designed by Bill Coore and Ben Crenshaw, the Cuscowilla course is situated on 6,847 yards and holds a course rating of 72.2 with a slope of 132 on Bermuda grass. “Top 100 Course You Can Play,” by Golf Magazine, 2006-07 and “Best Course You Can Play in Georgia” by Golfweek 2010. Cuscowilla’s 700-acre park-like resort has almost seven miles of water frontage on Lake Oconee. 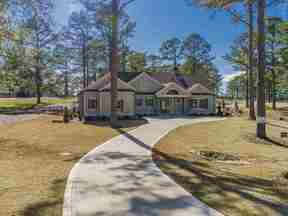 Throughout the natural beauty of the large pine trees and meadows are lakefront lots, estate golf lots, golf cottages and upscale townhomes and condominiums by ponds or on the lake. There are approximately 400 homesites on the golf course, waterfront, and wooded interior. The Frank Lloyd Wright inspired 14,000 square foot clubhouse includes The Golf House Grill and Pro Shop. For more dining, there is the Waterside Restaurant, with beautiful views of the lake, swimming pool, and golf course. Both are open to the public. Other amenities include a swimming pool and tennis. The Conference Center has four meeting rooms with wireless internet. Members can use the club villas for guests. Mixed Tees: Play middle tees except play the back tees on #9 and #18. Play the forward tees on #6, #10, #14 and #15.